So what’s your business plan? As a person with not one but TWO marketing degrees, you would think I’d have this all planned out. But here’s the truth – I hate paperwork. I hate writing things down. (Yes I know this is a blog and I’m writing. But it’s writing about things I like, not in a structured format so I can deal!). How I ever made it through two different degrees I’ll never know. (Here’s the secret – get into great groups during group projects. It will save you!!) I’m not saying I didn’t put in the time or the work, it’s just that everyone has their strengths. And mine is NOT paperwork. Give me the creative part of any project and let me run with it. Which is why tonight my sister and BIL created lists of projects for me. Banners, onesies, party favors – you name it, they gave me a list! Between now and Tuesday I am going to create as much as I can and we are going to photography them. My sister has a beautiful new house (and two beautiful girls who are going to be my brand ambassadors with my new onesie line) so there are plenty of options of places to take pictures of my stuff. So, no, I don’t have a business plan. I know I should and maybe one of these days I will sit down and write one. My BIL btw didn’t want to write one for me. Wth?? Until then, let me create beautiful things! Posted in Uncategorized and tagged business plan, creative, marketing. Bookmark the permalink. I’m getting ready for my next craft fair and as I am making one item, I get pulled in another direction. You know why? Because I watch YouTube and go on Facebook! People are just so darn creative and I keep thinking to myself, I can do that. Oh yeah – Pinterest (and my sister!!) are also enablers. HAHA. I saw something that I just felt I have to work on. There’s a woman who I follow on YouTube who does amazing tutorials and she is helping to organize this Caring Hearts Card Drive. It is for elderly people in nursing homes to receive cards. I want to participate in it in honor of my grandmother. She was in an assisted living facility for about two years before she passed away. I went to visit her as often as I could (being that I was in college in a different state it was not as often as I’d like, but I tried!). During that time, we saw people who never had any visitors. It made me so sad to see so many elderly people who didn’t have any friends or family close by or even living to pay a visit. The holidays were especially difficult. Even though I am short on time, I still plan to make at least a couple of cards to send on. If you want to participate, here is the link to the blog post. http://www.jennifermcguireink.com/2014/10/caring-hearts-card-drive-2014.html All the info is listed there on requirements and mailing addresses. To all my crafty friends – please consider making cards. Have your kids make cards! Nothing has to be professional looking. You do a good deed AND you are also eligible to win some amazing prizes! Last year there were around 3,600 cards collected. Let’s help make it bigger this year! Posted in Uncategorized and tagged assisted living facilities, card, cards for the elderly, caring hearts card drive, Christmas cards, holidays, Jennifer McGuire, nursing homes. Bookmark the permalink. Hi everyone! It’s Sunday again. Boo. Sadly, it means another week of work. Luckily, my work week only consists of two day this week. Even so, I am dreading this Sunday night. The hours of the day are going too quickly and I still have a To Do List a mile long. And somehow, with each thing that gets checked off, at least one more thing replaces it. Ugh. However, one of the (only) good things about Sunday is that it’s the day I get to do my Sketch Sunday videos. I really look forward to making them! As I have the past couple of Sketch Sundays, I used the My Favorite Things Sketch for my card. Their blog info is http://www.mftstamps.com/blog/category/wednesday-stamp-club/ if you want to go over and check out the sketch! I found the stamp set from My Favorite Thing that I wanted to use for her card. She loves cats so I decided to use the stamp set Pure Innocence Kitty Costume. First, I took a Nestabilities die and cut the shape from 65 lb white card stock from Recollections. I then stamped the main image in Momento Tuxedo black ink (because I don’t have the MFT black ink – yet! It’s on order!!!) I die cut a larger die from the same collection in a light blue paper, also from Recollections. I took a sponge dauber and some Distress ink in Broken China and inked around the edges of the two shapes I cut out, as well as the background and the patterned paper. I colored in the girl dressed as a cat using Promarkers, distress markers and Studio G markers. I stamped the girl again on patterned paper and then cut her dress out so that I could paper piece it to the image on the cut out shape. I did this by using a Zig Two Way Glue pen. I took a piece of 110 lb white card stock and cut it down to 7″ x 10″ and folded it in half to make a 5″ x 7″ card base. 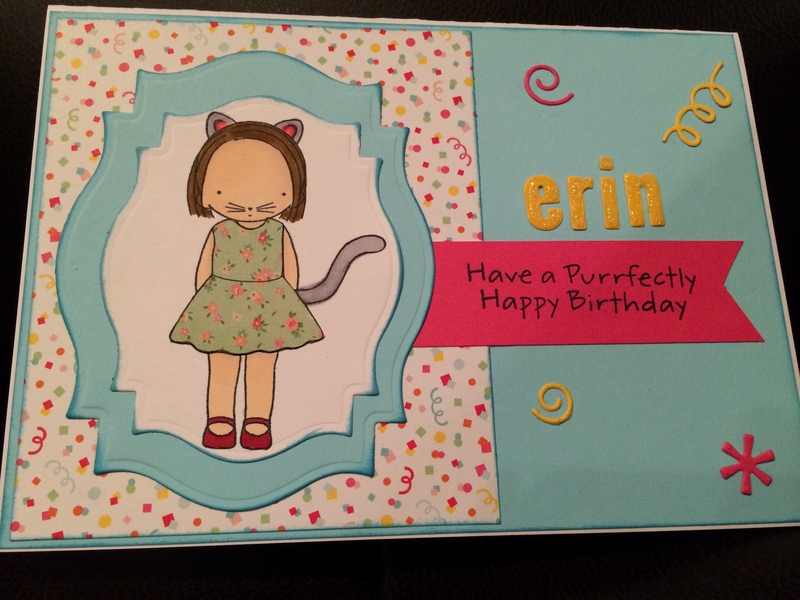 I cut the blue piece of card stock for the background to an 1/8″ smaller than the card base. 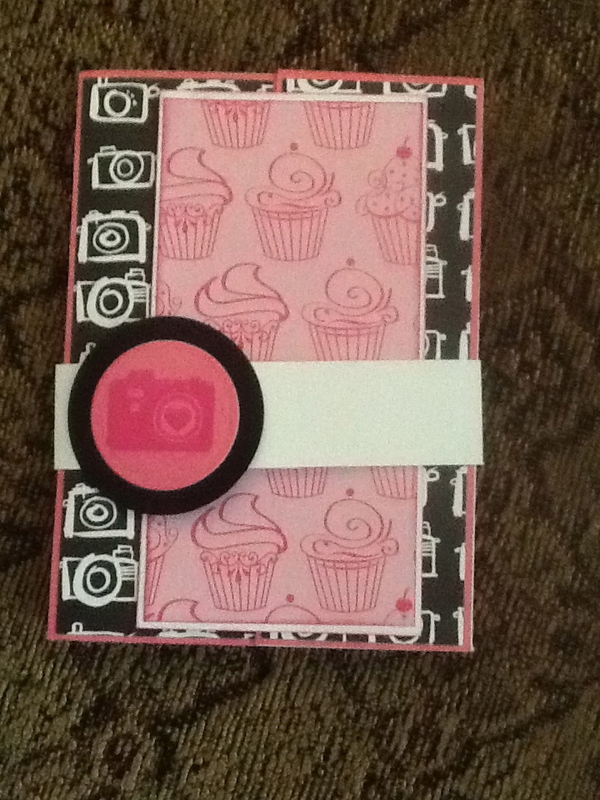 The patterned paper that I used is from the American Crafts Hip Hip Hooray paper pad. I used that as inspiration for the color pallet for the rest of the card. Her dress came from the paper pad Oh Darling by Crate Paper. The last pieces of card stock that I used were some scraps that I had lying around. They all come from Michael’s Recollections line – all open stock paper. I used several My Favorite Things dies. The first is the letters dies and the second is the party hat accompanying pieces. The latter was not in the YouTube video – it was added after the video was done because I looked at the card and it seemed like it still needed a “little something”. I also used some clear glitter glue on top of the letters to give it a little sparkle. Posted in Uncategorized and tagged american crafts, ATG, birthday card, cards, challenge, chelebelle1120, crate paper, Creativity, Cuttlebug, distress ink, distress markers, entering a card challenge, entering a sketch challenge, MFT dies, MFT stamps, My favorite things, nestabilities dies, paper piecing, promarkers, Pure Innocence stamps, studio g, using a sketch for inspiration. Bookmark the permalink. Yes, I know it’s Tuesday! I am a little (ok a lot) late with this post. I did manage to load the video yesterday, so that’s an improvement for me. I am trying to get better at this. I had a show on Saturday, so that past two weeks, that was all I focused on! Score at 2″ and 6″ to create the gate folds. Cupcake paper is cut at 2 1/2″ x 4 3/4″ with the white card stock cut at 1/8″ larger than the cupcake paper. Bellyband is cut at 1″ x 10″. Where you score depends on the thickness of the papers you use. Thanks for stopping by! Feel free to leave comments or questions and subscribe. I’d love to hear from you. Posted in Challenge and tagged bellyband, birthday card, cameras, challenge, circles, creating a card with a bellyband, Creativity, cupcakes, getting inspiration from a sketch, hallenge, hero arts neon ink, Laina Lamb stamp set, My favorite things, neon pink, Picture this stamp set, sketch challenge, sketch sunday, snappy birthday. Bookmark the permalink. I got a notification that today is my three year anniversary of starting my blog. It got me thinking of where I was three years ago when I was scared to even start this. So many things (good and bad) have happened since I started, both personally and professionally. I love that I have a blog to go back and see where it all started and how far I have come. Three years ago when I started this, I was an exercise fiend and probably in the best shape of my life. Little did I know that a couple of weeks later I would suffer an injury that would change things for me so drastically. This blog gave me something to do during the 5 months I was out of work for my first surgery and during the 7 months I was out for my second surgery. Basically, I worked on scrapbook projects, made YouTube videos and blogged. I would have gone crazy without these outlets. My job has changed drastically, while my title (and pay) have stayed the same. I’ve had three different bosses in less than three years, which makes it extremely difficult to feel settled. My two closest friends left the company and it’s been tough to get motivated because of the constant changes to policies, responsibilities and schedules. Needless to say, these past couple of years have been tough, with the last one being the toughest work-wise. These past three years haven’t all been bad. I started doing craft shows, which have been both fun and eye-opening. I think I have found my niche market – school craft fairs! I love meeting people who appreciate handcrafted things. I have become an aunt several times over during these past three years (mostly over the last year!!). One of the best things about the past three years is joining Etsy. Not Etsy itself per se (which I will discuss in a future post about all the changes to Etsy and my opinions on them! ), but the friends I have made. Before joining Etsy, I had a few friends that were crafty, but not a lot. One day I happened to join a team called South Jersey Etsians, started by a woman named Jaime and I started to meet all of these incredible artists. People who loved to make things by hand and who appreciated the time it takes to make things. I’m not saying that my friends and family don’t appreciate the things I make, because I know that they do!! It’s just now I have people that I can talk to about the creative side of business. But I think that the best thing that has changed over the past three years is my relationship with my sister. By no means are we best friends, but we have been through a lot in this time. She has helped me with a couple of shows, which was amazing. We worked so well together, making things for the craft shows. She has also helped me come up with new ideas for my business – new projects and new clients. So, thank you WordPress for reminding me of how much has changed in three years. The good, the bad and the ugly. Thank you for allowing me to document it all. It was fun to go down memory lane. But, now it’s back to work for me. Sketch Sunday anyone??? Posted in Uncategorized and tagged anniversary. Bookmark the permalink.